518 pages | 231 B/W Illus. Integrating fundamental research with the technical applications of this rapidly evolving field, Structure and Functional Properties of Colloidal Systems clearly presents the connections between structure and functional aspects in colloid and interface science. It explores the physical fundamentals of colloid science, new developments of synthesis and conditioning, and many possible applications. Divided into three parts, the book begins with a discussion of the theoretical side of colloid dynamics. It then transitions to dynamically arrested states and capillary forces in colloidal systems at fluid interfaces. Covering the structural aspects of different colloidal systems, the second section examines electric double layers and effective interactions as well as the structure of extremely bimodal suspensions and filaments made up of microsized magnetic particles. The contributors analyze the role played by the attractive interaction, confinement, and external fields on the structure of colloidal systems. They also discuss structural aspects in food emulsions and the rheological properties of structured fluids. The last part focuses on examples of functional colloids. These include polymer colloids, protein-functionalized colloidal particles, magnetic particles, metallic nanoparticles, micro- and nanogels, responsive microgels, colloidal photonic crystals, microfluidics, gel-glass dispersed liquid crystals (GDLCs) devices, and nanoemulsions. 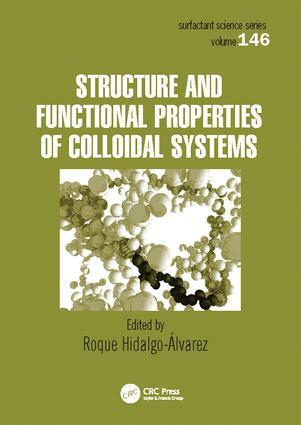 This volume provides a sound understanding of the link between the structure and functional properties in two- and three-dimensional colloidal systems. It describes techniques to functionalize colloids, characterization methods, the physical fundamentals of structure formation, diffusion dynamics, transport properties in equilibrium, the physical fundamentals of nonequilibrium systems, the measuring principles to exploit properties in applications, the differences in designing lab experiments and devices, and several application examples. Roque Hidalgo-Álvarez is a professor in the physics department at the University of Granada in Spain. He is also the president of the Colloid and Interface Science Group of the Spanish Royal Societies of Chemistry and Physics.